Even when you know you can only sing off tune, you still sing- who doesn't? ! 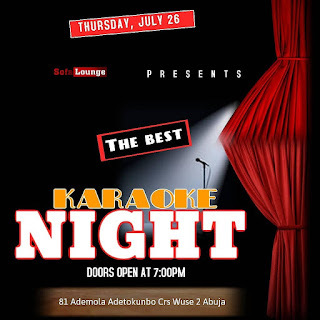 Karaoke Thursday Night @sofalounge is always a memorable experience. Feel free to bestow on them the job of sourcing for your favourite karaoke songs and ensure that the time spent @sofalounge is worth the while. Their doors are open from 7pm 2night. Sofalounge is located at no: 81 Ademola Adetokunbo Crescent, Wuse 2, Abuja.